A key advantage of seasteads is what Friedman calls “dynamic geography,” the fact that any given seasteading unit is free to join or leave larger units within seasteading communities. Seasteading platforms would likely band together to provide common services like police protection, but with the key difference that any platform that was dissatisfied with the value it was receiving from such jurisdictions could leave them at any time. [Friedman] argues that this would “move power downward,” giving smaller units within society greater leverage to ensure the interests of their members are being served. Seasteading is based on a delightfully bottom-up argument: that the problem with government is the lack of choice. If I don’t like my job, my apartment, or my grocery store, I can easily pick up and go somewhere else. The threat of exit induces employers, landlords, and store owners, and the like to treat us well without a lot of top-down oversight. In contrast, switching governments is hard, so governments treat us poorly. Seasteaders aim to change that. The pragmatic incrementalism of seasteading is also appealing. Friedman doesn’t have to foment a revolution, or even win an election, to give seasteading a try. If he can just a few hundred people of the merits of his ideas, they can go try it without needing assistance or support from the rest of us. If the experiment fails, the cost is relatively small. Yet seasteading is a deeply flawed project. In particular, the theory of dynamic geography is based on a fundamental misunderstanding of the relationships among mobility, wealth creation, and government power. In a real-world seasteading community, powerful economic forces would cripple dynamic geography and leave seasteaders no freer than the rest of us. To see the problem, imagine if someone developed the technology to transform my apartment building in Manhattan into a floating platform. Its owners could, at any time, float us out into the Hudson river and move to another state or country. Would they do it? Obviously not. They have hundreds of tenants who are paying good money to live in Manhattan. We’d be furious if we woke up one morning and found ourselves off the coast of South Carolina. Things get more, not less, difficult at larger scales. Imagine if Long Island (which includes the New York boroughs of Queens and Brooklyn and a lot of suburbs) were a huge ocean-going vessel. The residents of Long Island would overwhelmingly oppose moving; most of them have jobs, friends, familiy, churches, favorite restaurants, and other connections to the rest of the New York metro area. The value of being adjacent to Manhattan swamps whatever benefits there might be to being part of a state with lower taxes or better regulations. Successful cities need a variety of infrastructure—roads, electricity, network connectivity, water and sewer lines, and so forth. At small scales you could probably design this infrastructure to be completely modular. But that approach doesn’t scale; at some point you need expensive fixed infrastructure—multi-lane highways, bridges, water mains, subway lines, power plants—that only make economic sense if built on a geographically stable foundation. Such infrastructure wouldn’t be feasible in a “dynamic” city, and without such infrastructure it’s hard to imagine a city of even modest size being viable. I think the seasteaders’ response to this is that the advantages of increased liberty would be so large that people would be willing to deal with the inconveniences necessary to preserve dynamic geography. But here’s the thing: The question of whether the advantages of freedom (in the “leave me alone” sense) outweigh the benefits of living in large urban areas is not a theoretical one. If all you care about is avoiding the long arm of the law, that’s actually pretty easy to do. Buy a cabin in the woods in Wyoming and the government will pretty much leave you alone. Pick a job that allows you to deal in cash and you can probably get away without filing a tax return. In reality, hardly anyone does this. To the contrary, people have been leaving rural areas for high-tax, high-regulation cities for decades. Almost no one’s goal in life is to maximize their liberty in this abstract sense. Rather, liberty is valuable because it enables us to achieve other goals, like raising a family, having a successful career, making friends, and so forth. To achieve those kinds of goals, you pretty much have to live near other people, conform to social norms, and make long-term investments. And people who live close together for long periods of time need a system of mechanisms for resolving disputes, which is to say they need a government. The power of governments rests not on the immobility of real estate, but from the fact that people want to form durable relationships with other people. The residents of a seastead city would be no more enthusiastic about dynamic geopgrahy than the residents of Brooklyn. Which means that the government of the city would have the same kind of power Mayor Bloomberg has. Indeed, it would likely have more power, because the seastead city wouldn’t have New Jersey a few hundred yards away ready to take disaffected residents. What’s deeply flawed is your understanding of seasteading, as well as of economics, business, government and human motivation. hmm I dont toattaly agree with this nor these folks idea of seasteading. seems a bit odd to drag our land based ides out to sea. IMO (after a good lifetime at sea) we need to be thinking not about some tech marvel, but a social marvel. trying to escape a bunch of laws seems kinda a stupid idea unless you are planning on crime as your SOP. Personally I would be pushing for maritime law to cover all at sea operations world over let each person have there portion of fault. there are a few things land side folks should really do a bit of reading on befor they venture off shore and these folks i dont think have looked beyond there landside understandings. take for example one little tradition; giving aid to a vessel in distress. is some city going to come give aid? is it going to give aid to survivors? if so how much is going to be free (as it is now) or are we going to try to charge the survivors? as a vessel what is my responcibility to this city? if it is in distress how am i to give aid? do i treat it as another vessel or do i charge for my services? Etc. lots and lots of things need to be worked out if you plan on doing away with any and all law. We already have a frame work in place that addresses many of special circumstances at sea. its been proven over time and has worked. if some group puts a hazard to navigation out on the water how is it to be related to if the occupants think they have to follow no laws? No one here mentioned climate change. If it’s really going to get bad (I think it will), we will see floods, droughts, mass migration, conflicts, storms, disease, species extinction. My intuition tells me your safest bad would be to get in a boat and leave. You’re mobile, you’re always near to water and food, no floods. I predict there will be a mass exodus at some point, hundreds of thousands of people leaving for the oceans in sailing boats. It would help out greatly if there were marine bases by then. They could supply energy, provide food and fresh water. The idea of experimenting with governmental ideas sounds nice, but you would have to be brave to volunteer as a guinea pig. Also people are probably underestimating how the great powers in the world would react. Evade taxes and you might be punished with a trade embargo. Also there is nothing stopping countries from conquering your terriroties. It’s better to behave and keep your head down. Mr. Lee may or may not be accurate in his assessment of certain aspects of seasteading, in particular the form and basis promoted by the Seasteading Institute; however, he would do well to expand his horizons beyond the seasteading proposed by Mr. Freidman. I was first introduced to the concept of seasteading in late 1994 or early 1995 after reading “The Millennial Project” by Marshall T. Savage. He referred and promoted it by the name of “sea colonization” and gave a model city which he called Aquarius, which he spoke about at great length in the first chapter. The picture Mr. Savage painted sold me on the idea and it has been a desire of mine to build or at least live on Aquarius or an Aquarius like city ever since. The Foundation he started has long since dissipated and he himself abandoned the project. However his followers live on and the First Millennial Foundation has evolved into the Living Universe Foundation (www.luf.org) and the design concept of Aquarius has changed dramatically from that originally presented in the book. To this day, I still disagree with the political and economic theories supported by the LUF for their project. I do personally favor a more libertarian society however, having contemplated the original Aquarius design, in order to get it off the ground, it would need to be ran more like a business conglomerate than a lose-fitting changeable and random hodgepodge of free thinkers. Primarily because once Aquarius was built, it is essentially a fixed structure. A dissatisfied cell cannot unhitch its moorings and set sail for bluer horizons. Such a move would consist of the people packing their bags and moving to a new colony or starting one of their own from scratch. Further, the Aquarius design was to be anchored to the bottom of the ocean and would thereby not be easily moved from one location to another at the whim of the city mayor. The premise that seasteading is based on a bottom up argument stemming from dissatisfaction with government does not apply to all seasteaders. The sea colonies of the LUF were the first step in solving the problem of population explosion. The entire 8 step plan for colonizing the galaxy presented by Savage was to provide a solution to for future generations to have adequate hosing and food production by progressing forward and colonizing and learning space colony lifestyle while still on a forgiving earth before moving off world and among the stars. Mr. Lee’s analogy of a sudden seasteading Manhattan apartment building or Long Island does not hold water. The assumption in his argument is that the people would not want to leave the land-based connections to which they are accustomed. The people who choose seasteading would do so voluntarily. No one in any proposal for a seasteading island I’ve seen proposed moving people from land to a colony at gun point. As such, it is assumed the people that move there would be familiar with the possible scenarios and move ability of the colony before uprooting their land based life and adopting a life at sea. This would have been one of the characteristics they would have considered and decided they could live with by moving to such a colony or choosing to move to one that was more inline with the lifestyle they desired. Furthermore, a colony of 100,000 (Green Bay, WI is 104,057 according to the 2010 census for comparison) which is the specified estimate for the original Aquarius design, would have a population sufficiently large enough to have its own economy and the ability to be self sufficient. However, the concept for Aquarius was to be a advertising tool for the Millennial Project itself and therefore although operating mostly independent would trade and have close economic ties with the rest of the world through tourism and the sale of goods and services to generate revenue to advance galactic colonization. The point Mr. Lee misses in his New York boroughs analogy is that unlike the people in his analogy who are intricately connected to the rest of the New York Metro area. The people living in the seasteading islands would be connected to their island, not the rest of the world. These seasteading islands would largely be set in international waters. That is 200 nautical miles away from the coast. By comparison, Wichita, KS is 214.637 nautical miles away from Springfield, MO (247 land miles) if you take Highway 400 east which is the fastest route according to Google Maps. No one I know is willing to transverse such a distance on a regular basis in order to go to their favorite restaurant, attend a church service, or other such activities because such a distance by car would take an estimated 4 hours and 14 minutes at the speed limit and assuming no construction zones or detours are encountered along the way for just one direction, then you would have the return trip adding another 4 hours and 14 minutes or a total of 8 hours and 28 minutes round trip just to get from the city to the coast. Given that sea travel is slower than highway car travel on land, and that air travel is more expensive than any form of travel by land, such a trip from a seastead island to the mainland would be more of a luxury than a trapping of daily life. The question of infrastructure Mr. Lee raises does not apply to the original Aquarius design but may pose a problem for current designs of the newer LUF Aquarius concept which is more modular than originally proposed. I do not understand Mr. Lee’s point in connecting no one wanting liberty for the sake of liberty but rather for what liberty allows you to have, such as raising a family, etc. which requires being around people. The vast majority of Americans live in the country or in cities and towns with populations significantly less than 100,000 and they get along just fine. I know people (and have had family live in a town of just 2,900 people in Northwest Kansas (Norton, KS to be specific)) and although they may travel to other small towns of similar populations near by, they rarely ever venture into the big city like Hays (population of 20,210 in 2010) which is the closest big city to Norton, KS and they get along just fine living most or all of their lives in such a sparsely populated environment and find plenty of other people to associate with. This may seem incredible to a New York City native (population of 8,175,133 in 2010) which is almost 3 times that of the entire population of Kansas (2,853,116 in 2010) but to those of us in the rest of the world, 100,000 is plenty of people to associate with in order to raise a family and do other things that we may want to do. Again contrary to New York City native thinking, a lower population density would not necessarily mean near totalitarian power of the city government. Many cities and towns with significantly less populations do not have to resort to such aggressive tactics. What people want from government is not the ability to form durable relationships (which is not a power of government at all, even if the government wanted it, by the way) nor is it on the immobility or mobility of real estate. What people want from government is a system that provides a means to establishing justice and settling disputes in a civilized manner. In the modern world, people are progressing towards viewing the government as surrogate parents for adults who haven’t learned how to behave in a civilized manner with other people or be responsible for themselves without discharging their irresponsible behavior onto the public at large (there are obviously exceptions to these two categories of people). Having dry land underneath you is a very valuable natural resource, which is why all the remotely livable parts of this earth have been claimed already. Instead of trying to make some refurbished oil tanker livable , just buy 2000 or 20,000 scrub acres of Great Basin desert and make your libertopia there, you’d be streets ahead, other than WRT making the meth or generic pharmaceutical business plans. The bottom line is that land value is directly proportional to everything OUTSIDE the lot lines — the outside community and the wealth it creates. Wealth isn’t money, its foremost the state of being “well”, of having no unmet needs and wants. Wealth is the ham sandwich you had for lunch, and it’s the enjoyment of recreational opportunities, spectacle (watching things), etc. 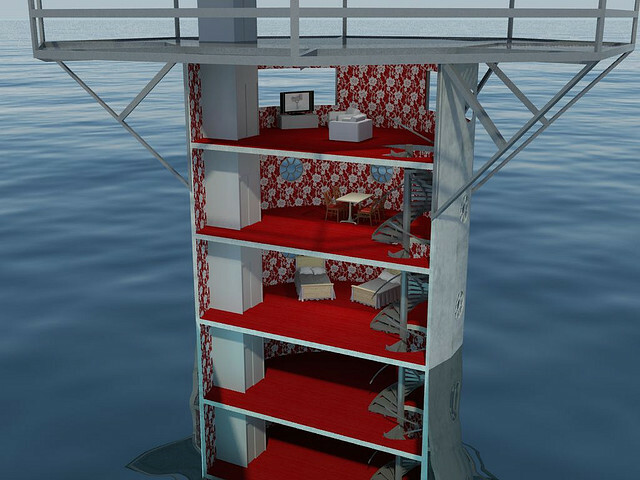 Living on what amounts to a floating prison — no thanks. Even Las Vegas itself, with all its amenities, is too physically isolated from “Mother Nature” for me. Maui, too. Great places to visit but I wouldn’t want to live there! And hey, as for ‘freedom’ — if you want to smoke pot, you can even move to WA or CO now. Gay marry — many states and more coming soon. The loss of effective freedom I’d suffer living on a boat or artificial island outweigh whatever putative libertopian benefits would accrue to me. And the cost of living differential would be well above what our modern state exacts. Well, maybe. One unpleasant fact we Americans are avoiding addressing is that taxes have to be almost doubled across the board this decade or next, to pay off the looming baby boom retirement and also fund our bloated government sector ($5T/yr in spending, that’s $50,000 per household, give or take). A much better strategy would be to marry a Norwegian, Singaporean, Canadian, Australian, or maybe Japanese national. I think these nation states will be doing OK this century. As Tim argues in his piece, for seasteading to work, the QUALITY OF LIFE experienced by the seasteaders has to beat what the major metros of the Pacific Rim are already providing. Main problem is the capital investment in keeping the whole thing above the waves. That’s a heavy up-front cost with substantial depreciation expense. Something like http://en.wikipedia.org/wiki/Malé could be buildable perhaps. But it just seems to be a pretty unlivable experience. 2 sq miles, 100,000 people. 100,000 gives you a big enough economy to support every needed tertiary-sector specialty (doctors, dentists, teachers — the trades that do not directly create tradable wealth per se but either preserve or restore it). Sure is a fun topic. I could write all night about it. Heh, Maui reminded me that Ellison semi-recently bought the island of Lanai itself for $500M. Too bad 100,000 seasteaders couldn’t have ponied up $5,000 each for a stake; Lanai would make a much better ‘testbed’ for self-organizing communities than some $500M artificial island. Try building the basic floating infrastructure to support one family out in the middle of the ocean for just $5000! But, logistically, the mid-Pacific isn’t that economical of a space. Shipping lanes from N.A. to Australia pass through, but that’s only 30M people at the destination, compared to the billion+ in NE Asia, which are served by the N Pacific routes better. shows where a good place to locate an entrepôt economy would be. A big challenge with seasteading is the simple division of labor. Japan’s economy is 1/6 devoted to exports, showing that for every 1 ‘valuable’ worker an economy needs 5 others in support. Thinking about how a cruise ship is run (more crew than ‘payload’) should be sobering for the seasteading movement. shows a new ship costs ~$10,000 per TEU (twenty-foot container) space. So a depreciating 20′ box vs. 3 acres of land that will be worth more in the future. Living under the bootheel of Government is not looking so bad when you do the actual math . . .
Land economics fascinates me, which is why this seasteading thing also fascinates me. Government is the only entity pretty much stifled in development, it’s because they have a monopoly on an area and aren’t forced to innovate. With independent floating cities it would provide competition for the best laws, regulations, economy because these cities are in competition to attract new residence. The theories about quality of life are just theories, you don’t know what the quality of life would be because no one has ever done this before. And in reply to Troyy, what are these effective freedoms lost? If anything you have more freedom, you missed the point about seasteading where you can move between cities and even land if you want. No one is telling you you HAVE to stay in the city, there are boats, if you want to get closer to mother nature and go camping, i doubt anyone will have a problem with that. How much freedom do you really have now, on land? It’s harder to pick up and move to another city more than ever, there are national parks and forest preserves that have curfews and essentially bar you from your mother nature. You can’t just pick up and go to another country there are long and often expensive steps you have to take. I’m confused on which freedoms would be lost. You may be right in about the economics of it but ten years from now that all can change with the exponential growth in technology.